skimage.transform.match_histograms(image, …) Adjust an image so that its cumulative histogram matches that of another. skimage.transform.hough_circle(image, radius) Perform a circular Hough transform. skimage.transform.hough_ellipse(image[, …]) Perform an elliptical Hough transform. skimage.transform.hough_line(image[, theta]) Perform a straight line Hough transform. 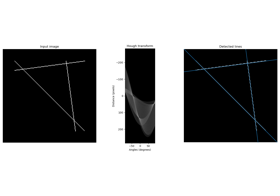 skimage.transform.probabilistic_hough_line(image) Return lines from a progressive probabilistic line Hough transform. skimage.transform.hough_circle_peaks(…[, …]) Return peaks in a circle Hough transform. skimage.transform.hough_line_peaks(hspace, …) Return peaks in a straight line Hough transform. 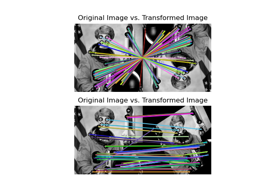 skimage.transform.radon(image[, theta, circle]) Calculates the radon transform of an image given specified projection angles. skimage.transform.iradon(radon_image[, …]) Inverse radon transform. skimage.transform.order_angles_golden_ratio(theta) Order angles to reduce the amount of correlated information in subsequent projections. skimage.transform.frt2(a) Compute the 2-dimensional finite radon transform (FRT) for an n x n integer array. skimage.transform.ifrt2(a) Compute the 2-dimensional inverse finite radon transform (iFRT) for an (n+1) x n integer array. skimage.transform.integral_image(image) Integral image / summed area table. skimage.transform.integrate(ii, start, end) Use an integral image to integrate over a given window. skimage.transform.warp(image, inverse_map[, …]) Warp an image according to a given coordinate transformation. skimage.transform.warp_coords(coord_map, shape) Build the source coordinates for the output of a 2-D image warp. 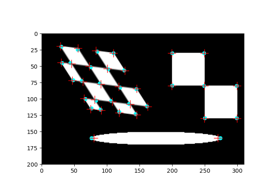 skimage.transform.estimate_transform(ttype, …) Estimate 2D geometric transformation parameters. skimage.transform.matrix_transform(coords, …) Apply 2D matrix transform. 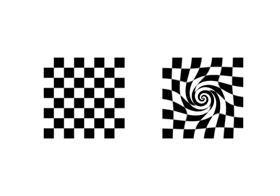 skimage.transform.swirl(image[, center, …]) Perform a swirl transformation. skimage.transform.resize(image, output_shape) Resize image to match a certain size. skimage.transform.rotate(image, angle[, …]) Rotate image by a certain angle around its center. 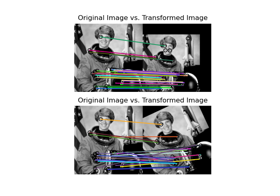 skimage.transform.rescale(image, scale[, …]) Scale image by a certain factor. 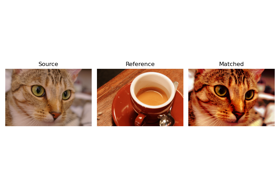 skimage.transform.downscale_local_mean(…) Down-sample N-dimensional image by local averaging. skimage.transform.pyramid_reduce(image[, …]) Smooth and then downsample image. skimage.transform.pyramid_expand(image[, …]) Upsample and then smooth image. skimage.transform.pyramid_gaussian(image[, …]) Yield images of the Gaussian pyramid formed by the input image. skimage.transform.pyramid_laplacian(image[, …]) Yield images of the laplacian pyramid formed by the input image. skimage.transform.seam_carve(*args, **kwargs) Seam carving has been removed because it is a patented algorithm. skimage.transform.AffineTransform([matrix, …]) 2D affine transformation. skimage.transform.PiecewiseAffineTransform() 2D piecewise affine transformation. Adjust an image so that its cumulative histogram matches that of another. The adjustment is applied separately for each channel. Input image. Can be gray-scale or in color. Image to match histogram of. Must have the same number of channels as image. Apply the matching separately for each channel. Thrown when the number of channels in the input image and the reference differ. Perform a circular Hough transform. Input image with nonzero values representing edges. Radii at which to compute the Hough transform. Floats are converted to integers. Normalize the accumulator with the number of pixels used to draw the radius. Extend the output size by twice the largest radius in order to detect centers outside the input picture. Hough transform accumulator for each radius. R designates the larger radius if full_output is True. Otherwise, R = 0. Perform an elliptical Hough transform. Bin size on the minor axis used in the accumulator. Maximal minor axis length. If None, the value is set to the half of the smaller image dimension. result : ndarray with fields [(accumulator, yc, xc, a, b, orientation)]. Where (yc, xc) is the center, (a, b) the major and minor axes, respectively. The orientation value follows skimage.draw.ellipse_perimeter convention. The accuracy must be chosen to produce a peak in the accumulator distribution. In other words, a flat accumulator distribution with low values may be caused by a too low bin size. Perform a straight line Hough transform. Angles at which to compute the transform, in radians. Defaults to a vector of 180 angles evenly spaced from -pi/2 to pi/2. Angles at which the transform is computed, in radians. The origin is the top left corner of the original image. X and Y axis are horizontal and vertical edges respectively. The distance is the minimal algebraic distance from the origin to the detected line. The angle accuracy can be improved by decreasing the step size in the theta array. 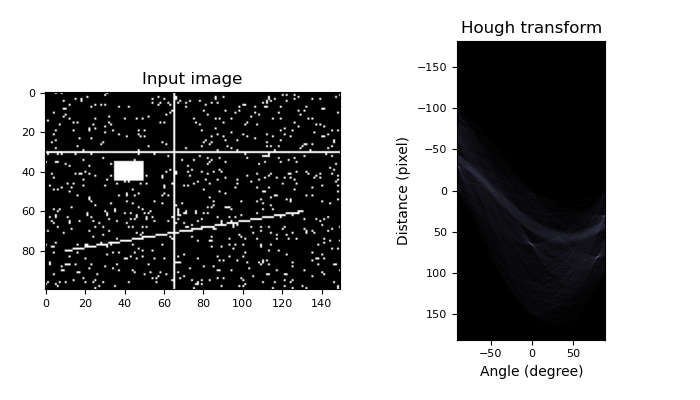 Return lines from a progressive probabilistic line Hough transform. Minimum accepted length of detected lines. Increase the parameter to extract longer lines. Maximum gap between pixels to still form a line. Increase the parameter to merge broken lines more aggressively. Angles at which to compute the transform, in radians. If None, use a range from -pi/2 to pi/2. Seed to initialize the random number generator. List of lines identified, lines in format ((x0, y0), (x1, y1)), indicating line start and end. C. Galamhos, J. Matas and J. Kittler, “Progressive probabilistic Hough transform for line detection”, in IEEE Computer Society Conference on Computer Vision and Pattern Recognition, 1999. Return peaks in a circle Hough transform. Identifies most prominent circles separated by certain distances in a Hough space. Non-maximum suppression with different sizes is applied separately in the first and second dimension of the Hough space to identify peaks. Hough spaces returned by the hough_circle function. 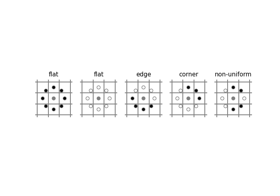 Radii corresponding to Hough spaces. Minimum distance separating centers in the x dimension. Minimum distance separating centers in the y dimension. Minimum intensity of peaks in each Hough space. Default is 0.5 * max(hspace) . Maximum number of peaks in each Hough space. When the number of peaks exceeds num_peaks , only num_peaks coordinates based on peak intensity are considered for the corresponding radius. Maximum number of peaks. When the number of peaks exceeds num_peaks , return num_peaks coordinates based on peak intensity. If True, normalize the accumulator by the radius to sort the prominent peaks. Peak values in Hough space, x and y center coordinates and radii. Return peaks in a straight line Hough transform. Identifies most prominent lines separated by a certain angle and distance in a Hough transform. Non-maximum suppression with different sizes is applied separately in the first (distances) and second (angles) dimension of the Hough space to identify peaks. Hough space returned by the hough_line function. Angles returned by the hough_line function. Assumed to be continuous. ( angles[-1] - angles == PI ). Distances returned by the hough_line function. Minimum distance separating lines (maximum filter size for first dimension of hough space). Minimum angle separating lines (maximum filter size for second dimension of hough space). Minimum intensity of peaks. Default is 0.5 * max(hspace) . Peak values in Hough space, angles and distances. Calculates the radon transform of an image given specified projection angles. Input image. The rotation axis will be located in the pixel with indices (image.shape // 2, image.shape // 2). Projection angles (in degrees). If None , the value is set to np.arange(180). Assume image is zero outside the inscribed circle, making the width of each projection (the first dimension of the sinogram) equal to min(image.shape). Radon transform (sinogram). The tomography rotation axis will lie at the pixel index radon_image.shape // 2 along the 0th dimension of radon_image. AC Kak, M Slaney, “Principles of Computerized Tomographic Imaging”, IEEE Press 1988. 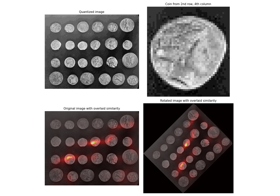 Reconstruct an image from the radon transform, using the filtered back projection algorithm. 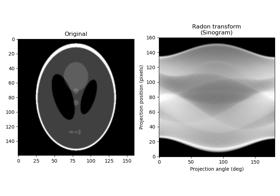 Image containing radon transform (sinogram). 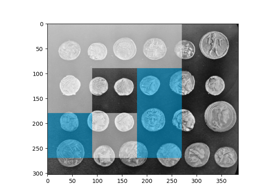 Each column of the image corresponds to a projection along a different angle. The tomography rotation axis should lie at the pixel index radon_image.shape // 2 along the 0th dimension of radon_image. Reconstruction angles (in degrees). Default: m angles evenly spaced between 0 and 180 (if the shape of radon_image is (N, M)). Number of rows and columns in the reconstruction. Filter used in frequency domain filtering. Ramp filter used by default. Filters available: ramp, shepp-logan, cosine, hamming, hann. Assign None to use no filter. Interpolation method used in reconstruction. Methods available: ‘linear’, ‘nearest’, and ‘cubic’ (‘cubic’ is slow). Assume the reconstructed image is zero outside the inscribed circle. Also changes the default output_size to match the behaviour of radon called with circle=True. Reconstructed image. The rotation axis will be located in the pixel with indices (reconstructed.shape // 2, reconstructed.shape // 2). It applies the Fourier slice theorem to reconstruct an image by multiplying the frequency domain of the filter with the FFT of the projection data. This algorithm is called filtered back projection. 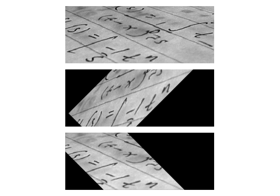 Reconstruct an image from the radon transform, using a single iteration of the Simultaneous Algebraic Reconstruction Technique (SART) algorithm. 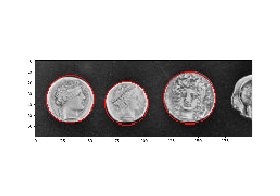 Image containing an initial reconstruction estimate. Shape of this array should be (radon_image.shape, radon_image.shape). The default is an array of zeros. Shift the projections contained in radon_image (the sinogram) by this many pixels before reconstructing the image. The i’th value defines the shift of the i’th column of radon_image. Relaxation parameter for the update step. A higher value can improve the convergence rate, but one runs the risk of instabilities. Values close to or higher than 1 are not recommended. Algebraic Reconstruction Techniques are based on formulating the tomography reconstruction problem as a set of linear equations. Along each ray, the projected value is the sum of all the values of the cross section along the ray. A typical feature of SART (and a few other variants of algebraic techniques) is that it samples the cross section at equidistant points along the ray, using linear interpolation between the pixel values of the cross section. The resulting set of linear equations are then solved using a slightly modified Kaczmarz method. When using SART, a single iteration is usually sufficient to obtain a good reconstruction. Further iterations will tend to enhance high-frequency information, but will also often increase the noise. Kohler, T. “A projection access scheme for iterative reconstruction based on the golden section.” Nuclear Science Symposium Conference Record, 2004 IEEE. Vol. 6. IEEE, 2004. Order angles to reduce the amount of correlated information in subsequent projections. Projection angles in degrees. Duplicate angles are not allowed. The returned generator yields indices into theta such that theta[indices] gives the approximate golden ratio ordering of the projections. In total, len(theta) indices are yielded. All non-negative integers < len(theta) are yielded exactly once. The method used here is that of the golden ratio introduced by T. Kohler. Winkelmann, Stefanie, et al. “An optimal radial profile order based on the Golden Ratio for time-resolved MRI.” Medical Imaging, IEEE Transactions on 26.1 (2007): 68-76. Compute the 2-dimensional finite radon transform (FRT) for an n x n integer array. A 2-D square n x n integer array. Finite Radon Transform array of (n+1) x n integer coefficients. The FRT has a unique inverse if and only if n is prime. [FRT] The idea for this algorithm is due to Vlad Negnevitski. Compute the 2-dimensional inverse finite radon transform (iFRT) for an (n+1) x n integer array. A 2-D (n+1) row x n column integer array. Inverse Finite Radon Transform array of n x n integer coefficients. The FRT has a unique inverse if and only if n is prime. See  for an overview. The idea for this algorithm is due to Vlad Negnevitski. Integral image / summed area table. Integral image/summed area table of same shape as input image. F.C. Crow, “Summed-area tables for texture mapping,” ACM SIGGRAPH Computer Graphics, vol. 18, 1984, pp. 207-212. Use an integral image to integrate over a given window. Coordinates of top left corner of window(s). Each tuple in the list contains the starting row, col, … index i.e [(row_win1, col_win1, …), (row_win2, col_win2,…), …] . Coordinates of bottom right corner of window(s). Each tuple in the list containing the end row, col, … index i.e [(row_win1, col_win1, …), (row_win2, col_win2, …), …] . Integral (sum) over the given window(s). Warp an image according to a given coordinate transformation. Inverse coordinate map, which transforms coordinates in the output images into their corresponding coordinates in the input image. There are a number of different options to define this map, depending on the dimensionality of the input image. A 2-D image can have 2 dimensions for gray-scale images, or 3 dimensions with color information. For 2-D images, you can directly pass a transformation object, e.g. skimage.transform.SimilarityTransform , or its inverse. For 2-D images, you can pass a (3, 3) homogeneous transformation matrix, e.g. skimage.transform.SimilarityTransform.params . For 2-D images, a function that transforms a (M, 2) array of (col, row) coordinates in the output image to their corresponding coordinates in the input image. Extra parameters to the function can be specified through map_args . For N-D images, you can directly pass an array of coordinates. The first dimension specifies the coordinates in the input image, while the subsequent dimensions determine the position in the output image. E.g. in case of 2-D images, you need to pass an array of shape (2, rows, cols), where rows and cols determine the shape of the output image, and the first dimension contains the (row, col) coordinate in the input image. See scipy.ndimage.map_coordinates for further documentation. Note, that a (3, 3) matrix is interpreted as a homogeneous transformation matrix, so you cannot interpolate values from a 3-D input, if the output is of shape (3,). See example section for usage. Keyword arguments passed to inverse_map . Shape of the output image generated. By default the shape of the input image is preserved. Note that, even for multi-band images, only rows and columns need to be specified. Points outside the boundaries of the input are filled according to the given mode. Modes match the behaviour of numpy.pad . Used in conjunction with mode ‘constant’, the value outside the image boundaries. Whether to clip the output to the range of values of the input image. This is enabled by default, since higher order interpolation may produce values outside the given input range. The input image is converted to a double image. In case of a SimilarityTransform , AffineTransform and ProjectiveTransform and order in [0, 3] this function uses the underlying transformation matrix to warp the image with a much faster routine. The following image warps are all equal but differ substantially in execution time. The image is shifted to the bottom. Build the source coordinates for the output of a 2-D image warp. Return input coordinates for given output coordinates. Coordinates are in the shape (P, 2), where P is the number of coordinates and each element is a (row, col) pair. Shape of output image (rows, cols[, bands]). dtype for return value (sane choices: float32 or float64). Coordinates for scipy.ndimage.map_coordinates , that will yield an image of shape (orows, ocols, bands) by drawing from source points according to the coord_transform_fn . This is a lower-level routine that produces the source coordinates for 2-D images used by warp() . It is provided separately from warp to give additional flexibility to users who would like, for example, to re-use a particular coordinate mapping, to use specific dtypes at various points along the the image-warping process, or to implement different post-processing logic than warp performs after the call to ndi.map_coordinates . Estimate 2D geometric transformation parameters. You can determine the over-, well- and under-determined parameters with the total least-squares method. Number of source and destination coordinates must match. Transform object containing the transformation parameters and providing access to forward and inverse transformation functions. The amount of swirling applied. The extent of the swirl in pixels. The effect dies out rapidly beyond radius . Additional rotation applied to the image. Swirled version of the input. Shape of the output image generated. By default the shape of the input image is preserved. The order of the spline interpolation, default is 1. The order has to be in the range 0-5. See skimage.transform.warp for detail. Points outside the boundaries of the input are filled according to the given mode, with ‘constant’ used as the default. Modes match the behaviour of numpy.pad . Resize image to match a certain size. Performs interpolation to up-size or down-size images. Note that anti- aliasing should be enabled when down-sizing images to avoid aliasing artifacts. 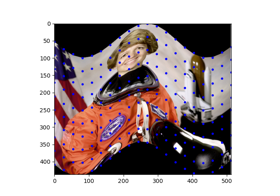 For down-sampling N-dimensional images with an integer factor also see skimage.transform.downscale_local_mean . Size of the generated output image (rows, cols[, …][, dim]) . If dim is not provided, the number of channels is preserved. In case the number of input channels does not equal the number of output channels a n-dimensional interpolation is applied. Resized version of the input. 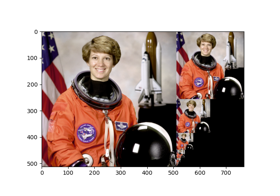 Whether to apply a Gaussian filter to smooth the image prior to down-scaling. 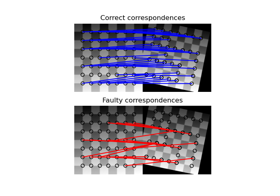 It is crucial to filter when down-sampling the image to avoid aliasing artifacts. Standard deviation for Gaussian filtering to avoid aliasing artifacts. By default, this value is chosen as (1 - s) / 2 where s is the down-scaling factor. Modes ‘reflect’ and ‘symmetric’ are similar, but differ in whether the edge pixels are duplicated during the reflection. As an example, if an array has values [0, 1, 2] and was padded to the right by four values using symmetric, the result would be [0, 1, 2, 2, 1, 0, 0], while for reflect it would be [0, 1, 2, 1, 0, 1, 2]. Rotate image by a certain angle around its center. Rotation angle in degrees in counter-clockwise direction. 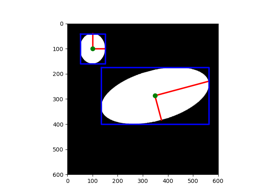 Determine whether the shape of the output image will be automatically calculated, so the complete rotated image exactly fits. Default is False. The rotation center. If center=None, the image is rotated around its center, i.e. center=(cols / 2 - 0.5, rows / 2 - 0.5). Please note that this parameter is (cols, rows), contrary to normal skimage ordering. Rotated version of the input. Scale image by a certain factor. 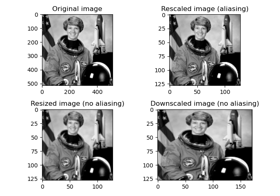 Performs interpolation to up-scale or down-scale images. Note that anti- aliasing should be enabled when down-sizing images to avoid aliasing artifacts. For down-sampling N-dimensional images with an integer factor also see skimage.transform.downscale_local_mean . Scale factors. Separate scale factors can be defined as (rows, cols[, …][, dim]) . Scaled version of the input. Whether the last axis of the image is to be interpreted as multiple channels or another spatial dimension. By default, is set to True for 3D (2D+color) inputs, and False for others. Starting in release 0.16, this will always default to False. Down-sample N-dimensional image by local averaging. The image is padded with cval if it is not perfectly divisible by the integer factors. In contrast to the 2-D interpolation in skimage.transform.resize and skimage.transform.rescale this function may be applied to N-dimensional images and calculates the local mean of elements in each block of size factors in the input image. Array containing down-sampling integer factor along each axis. Constant padding value if image is not perfectly divisible by the integer factors. Down-sampled image with same number of dimensions as input image. Smooth and then downsample image. Sigma for Gaussian filter. Default is 2 * downscale / 6.0 which corresponds to a filter mask twice the size of the scale factor that covers more than 99% of the Gaussian distribution. Order of splines used in interpolation of downsampling. See skimage.transform.warp for detail. The mode parameter determines how the array borders are handled, where cval is the value when mode is equal to ‘constant’. Value to fill past edges of input if mode is ‘constant’. Smoothed and downsampled float image. Upsample and then smooth image. Sigma for Gaussian filter. Default is 2 * upscale / 6.0 which corresponds to a filter mask twice the size of the scale factor that covers more than 99% of the Gaussian distribution. Order of splines used in interpolation of upsampling. See skimage.transform.warp for detail. Upsampled and smoothed float image. Yield images of the Gaussian pyramid formed by the input image. Recursively applies the pyramid_reduce function to the image, and yields the downscaled images. Note that the first image of the pyramid will be the original, unscaled image. The total number of images is max_layer + 1 . In case all layers are computed, the last image is either a one-pixel image or the image where the reduction does not change its shape. Number of layers for the pyramid. 0th layer is the original image. Default is -1 which builds all possible layers. Generator yielding pyramid layers as float images. Yield images of the laplacian pyramid formed by the input image. Note that the first image of the pyramid will be the difference between the original, unscaled image and its smoothed version. The total number of images is max_layer + 1 . 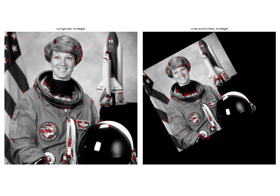 In case all layers are computed, the last image is either a one-pixel image or the image where the reduction does not change its shape. Seam carving has been removed because it is a patented algorithm. The Euclidean transformation is a rigid transformation with rotation and translation parameters. The similarity transformation extends the Euclidean transformation with a single scaling factor. Rotation angle in counter-clockwise direction as radians. Estimate the transformation from a set of corresponding points. True, if model estimation succeeds. The similarity transformation extends the Euclidean transformation with a single scaling factor in addition to the rotation and translation parameters. Shear angle in counter-clockwise direction as radians. Apply a projective transformation (homography) on coordinates. In case of total least-squares the solution of this homogeneous system of equations is the right singular vector of A which corresponds to the smallest singular value normed by the coefficient c3. 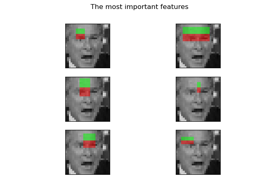 The essential matrix relates corresponding points between a pair of calibrated images. The matrix transforms normalized, homogeneous image points in one image to epipolar lines in the other image. The essential matrix is only defined for a pair of moving images capturing a non-planar scene. In the case of pure rotation or planar scenes, the homography describes the geometric relation between two images ( ProjectiveTransform ). If the intrinsic calibration of the images is unknown, the fundamental matrix describes the projective relation between the two images ( FundamentalMatrixTransform ). Rotation matrix of the relative camera motion. Translation vector of the relative camera motion. The vector must have unit length. Estimate essential matrix using 8-point algorithm. The 8-point algorithm requires at least 8 corresponding point pairs for a well-conditioned solution, otherwise the over-determined solution is estimated. The fundamental matrix relates corresponding points between a pair of uncalibrated images. The matrix transforms homogeneous image points in one image to epipolar lines in the other image. The fundamental matrix is only defined for a pair of moving images. In the case of pure rotation or planar scenes, the homography describes the geometric relation between two images ( ProjectiveTransform ). If the intrinsic calibration of the images is known, the essential matrix describes the metric relation between the two images ( EssentialMatrixTransform ). Estimate fundamental matrix using 8-point algorithm. Epipolar lines in the source image. The Sampson distance is the first approximation to the geometric error. Polynomial coefficients where N * 2 = (order + 1) * (order + 2) . So, a_ji is defined in params[0, :] and b_ji in params[1, :] . Polynomial order (number of coefficients is order + 1). Control points are used to define the mapping. The transform is based on a Delaunay triangulation of the points to form a mesh. Each triangle is used to find a local affine transform. Affine transformations for each triangle in the mesh. Inverse affine transformations for each triangle in the mesh. Coordinates outside of the mesh will be set to - 1 .